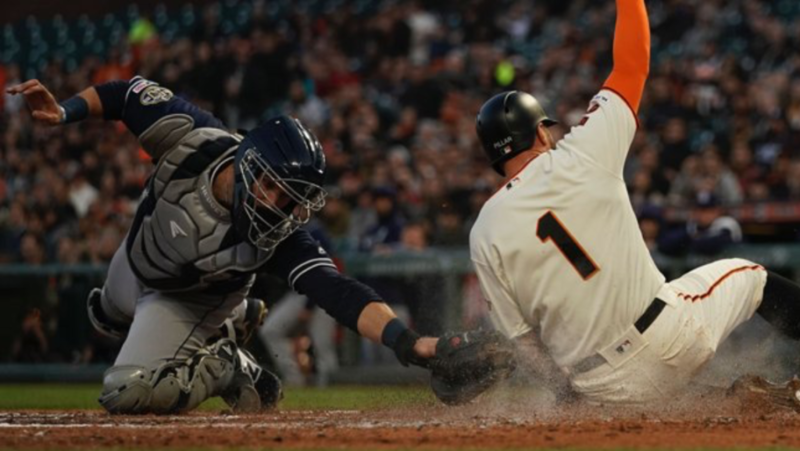 After making an incredible comeback in the first game of this three-game set with the Giants, the Padres were unable to come back in game two as they fell to the Giants by a score of 7-2 on Tuesday night. Andy Green and the Padres sent last year’s ace Joey Lucchesi to the mound to matchup against Giants’ pitcher Derek Holland. Lucchesi entered the night with a 2-0 record and a 0.00 ERA with two quality outings under his belt. 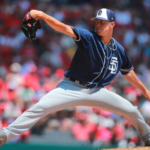 His counterpart, Holland, came into this game with an 0-1 record and a 5.40 ERA with his one loss coming in the second game of the season at Petco Park against the Padres. Things looked bright for the Friars in the first inning. Wil Myers singled on a line drive to center fielder Kevin Pillar and gave the Padres a baserunner for both Manny Machado and Franmil Reyes to work with. After Machado worked a 2-1 count, Myers took off for second base and was gunned down by Giants catcher Buster Posey. Fortunately for the Friars, Machado would work a walk and paved the way for Franmil Reyes to do some damage. Reyes took advantage of his opportunity and smoked a line drive to left field, but was thrown out at second base trying to leg out a double by Giants’ left fielder Brandon Belt. The Giants opened the flood gates early in this matchup and did not waste time looking back. Buster Posey, Brandon Crawford, and Evan Longoria opened the bottom of the second inning with three weak hits to right field that resulted in a 2-0 lead for the Giants. 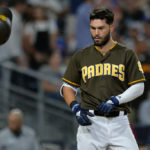 The offensive outburst continued, as former Padre Yangervis Solarte blooped a double into right field that would plate Crawford and make the score 3-0. After a Gerardo Parra walk, recently acquired Kevin Pillar delivered the kill shot as he lined a ball into left field that skipped past Hunter Renfroe and resulted in a 6-0 lead for the Giants. The Padres would threaten in the top of the fourth inning. After a Manny Machado drew a two-out walk, Hunter Renfroe would line a single into left field that allowed young star Fernando Tatis Jr. to do some damage. Tatis, who struggled on the night, struck out looking on a questionable call by the home plate umpire. San Fransisco would add another run in the bottom of the fourth. 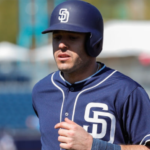 Parra hit a ground ball past the glove of second baseman Ian Kinsler and would take advantage of a miscue by right fielder Franmil Reyes to stretch it out into a double. After a Holland sacrifice bunt, Parra would score on a Kevin Pillar sacrifice fly to left field. 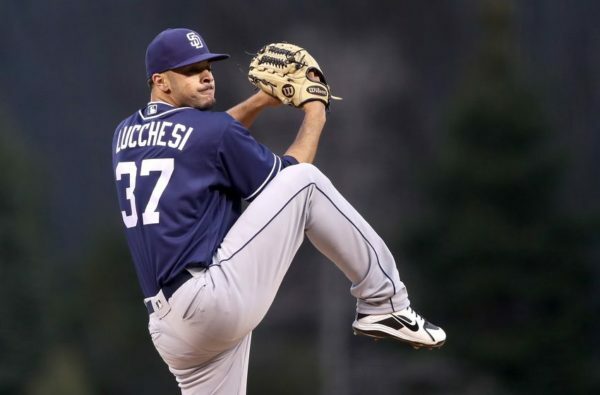 Padres’ starter Joey Lucchesi struggled for the first time all season. 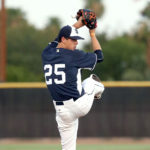 The 25-year-old gave up seven earned runs over four innings on 76 pitches as he struck out four batters and walked four. Lucchesi was quite unlucky all night, as the Giants did most of their damage on bloop hits and generated a lot of weak contact. The very few balls that were hit hard all night came on elevated “churves “that need to be located better to avoid severe damage. Lucchesi did miss spots more often than not, but he was plagued with a lot of unlucky balls for the majority of this game. 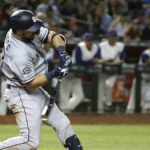 Despite a quiet evening from the majority of their offense, the Padres managed to scratch a run across in the top of the 7th inning. Left fielder Hunter Renfroe turned on a fastball from Holland and deposited a 423 foot home run into the left field bleachers. 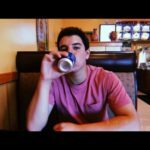 Renfroe worked the count full in an impressive at-bat against the Giants’ southpaw before taking him deep for his team-leading fourth home run in only 29 at-bats this season. Robbie Erlin took over in the fifth inning after Lucchesi was pulled and was masterful for the Friars. The 28-year-old pitched cruised through three innings, allowing no hits and only one Giant to reach base while striking out four batters. 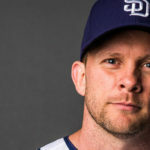 Despite the loss, Erlin’s ability to go three innings gave the San Diego bullpen much-needed rest. Adam Warren took over for Erlin in the bottom of the 8th and pitched a clean inning. The Padres would strike again in the top of the 8th. Center fielder Manuel Margot led the inning off with a single and pinch hitter Greg Garcia grounded into a fielders choice at second base. After Ian Kinsler flew out to right field, Wil Myers stepped up to the plate. Myers worked a ten-pitch at-bat with Giants’ reliever Trevor Gott and crushed a 94 mph fastball to left field for a double that would score Garcia. Manny Machado flew out to first baseman Tyler Austin to end the inning. Mark Melancon took over in the ninth and sealed the victory for Bruce Bochy‘s squad. Kevin Pillar drove in four runs on the night for the Giants. 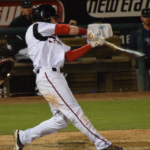 Derek Holland earned his first win in 2019 after going seven strong innings where he struck out nine batters, walked two, and gave up one earned run. Hunter Renfroe and Wil Myers both had two hits for the Padres, while Manny Machado worked two walks. These two teams will meet in the rubber match on Wednesday afternoon at 12:45 PDT. Rookie Nick Margevicius will toe the rubber for the Padres, while Derek Rodriguez will pitch for the Giants.